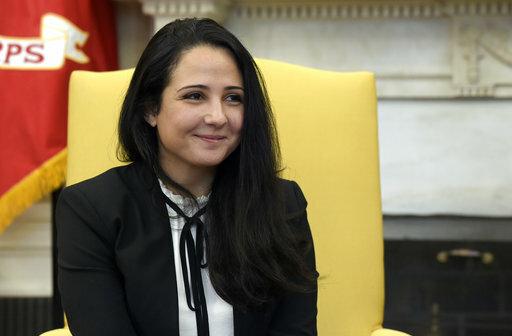 WASHINGTON (CN) – An aid worker held for nearly three years in an Egyptian prison returned to the United States Thursday night, with the White House calling President Donald Trump’s talks with the Egyptian president critical to securing her release. Aya Hijazi spent almost three years in prison in Egypt after she was arrested while working with the Belady Foundation, a humanitarian group helping poor children in Cairo find shelter. Along with her husband and six colleagues at the foundation, Hijazi was eventually accused of sexually assaulting children and convincing them to join protests in favor of the Muslim Brotherhood. Human Rights Watch last month called the trial against the Belady Foundation workers a “travesty,” saying it was built on shoddy evidence and that the Egyptian court did not provide the defendants with access to lawyers or the ability to craft a defense. A dual national who grew up just outside of Washington in Falls Church, Va., Hijazi was finally acquitted earlier this week after two presidential administrations spent years working to win her release. Hijazi landed just outside of Washington on Thursday morning, according to the Washington Post. She went to the White House on Friday morning, where she and her brother met with Trump in the Oval Office. “We are very happy to have Aya back home and it’s a great honor to have her in the Oval Office,” Trump said at the White House Friday.